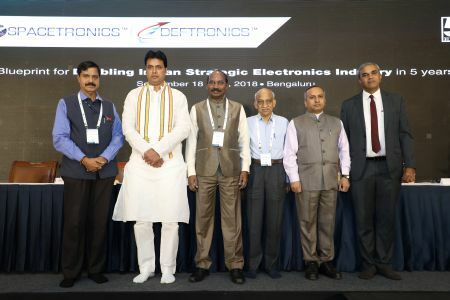 BANGALORE, INDIA: India Electronics and Semiconductor Association (IESA) hosted the 1st edition of Spacetronics 2018 in Bangalore to facilitate discussion on Space technology and policies. IESA is assisting ISRO in establishing Technologies Incubation Centres across the country and the first such centre is starting at NIT Agartala in Tripura state. The objective of Technology incubation centres is to develop cutting edge technologies needed by the space sector and creation of IPs. This is going to be a great push towards Make in India. ISRO Technology Incubation Centre, Agartala was launched remotely byBiplab Kumar Deb, Chief Minister, Tripura. The speakers also highlighted the necessity to focus on the unbridged talent pool, need for accelerating investment promotions, international alliances, start-up ecosystem and policy implementation to strengthen innovation and facilitate entrepreneurship in the Space Technology domain of the country.